Grew up in Western Mass, then spent a few years in Vermont before relocating to Utah. Between family, swimming holes, and the mountain biking, my heart will forever be in New England. I love to pedal, despite growing up racing Downhill. When I'm not writing copy for Competitive Cyclist, I'm usually riding bikes, snowboarding, drinking coffee, or some combination thereof. The Sea Otter Classic is one of cycling’s true institutions. For just shy of 30 years racers, fans, and industry types have descended on northern California’s iconic Laguna Seca Raceway in what has become one of the sport’s premier events. During the rest of the year, Laguna Seca is known as a world class motorsports facility, hosting races like the Monterey Grand Prix and a stop on the Superbike World Series. But for four days in April, the combination of races, media, and community events draws a staggering cross section of the world’s top professional cyclists, not to mention many of North America’s committed amateur racers and tens of thousands of cycling fans of all stripes. It’s a unique event that celebrates every conceivable aspect of the sport we love so dearly. It’s also the biggest cycling tradeshow in North America, which makes it an excellent place to see new products and witness emerging trends. 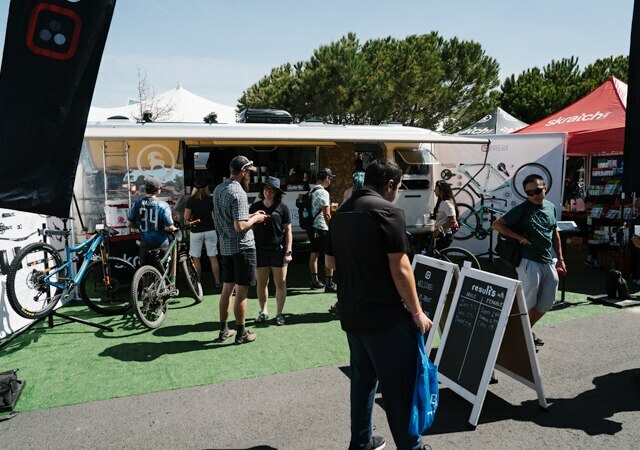 This year, Competitive Cyclist teamed up with our friends at Skratch Labs to collaborate on a booth space, where we served up coffee from La Colombe, as well as an assortment of Skratch’s excellent rice cakes. Our Events team was in full effect, bolstered by Gearheads Katie Harker and Daniel Iverson who were on hand to connect with customers and introduce attendees to Competitive Cyclist. We also hosted a One Minute Watt Challenge in partnership with Stages, with each day’s winner earning a $100 Competitive Cyclist gift certificate, and the individual with the highest watts per kilo on the weekend taking home a Stages power meter for their efforts. Of course, our corner of the pits was but a small piece of the behemoth that is Sea Otter. In no particular order, here are a few of the things that caught our eye. Yeti’s premier 29 inch trail bike, the SB130, is capable of hitting far above its weight class, so it was only a matter of time before Yeti gave it their “Lunch Ride” treatment. After about a year of experimentation, a large chunk of Yeti’s staff ended up on SB130’s bumped to 136mm of travel via a longer stroke shock, and balanced with a 160mm fork. 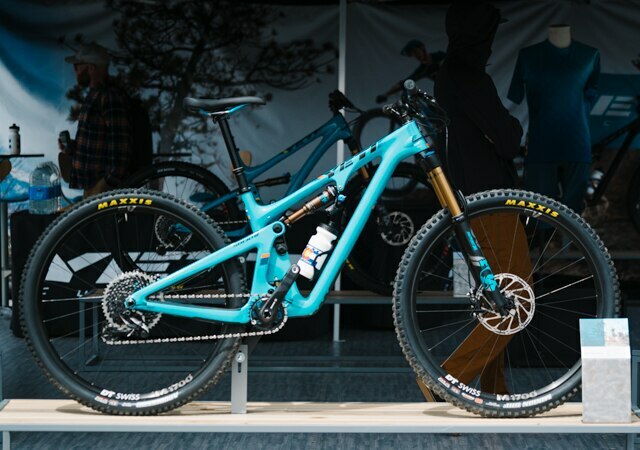 That configuration is now available over the counter, further blurring the boundaries between the SB130 and its Enduro World Series focused big brother, the SB150. We suspect that this configuration will be very popular, as it should add just a bit of extra capability to the already very impressive SB130. No, XTR isn’t new. It was actually launched at Sea Otter 2018. 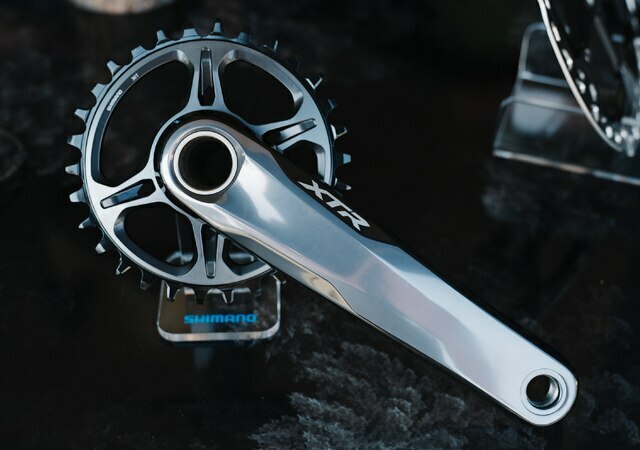 But after a year of fits and starts relating to production-based challenges, the XTR 9100 groupset is now widely available, including OEM channels. That means that for those looking at a new top of the line mountain bike, XX1 Eagle finally has some legitimate competition. 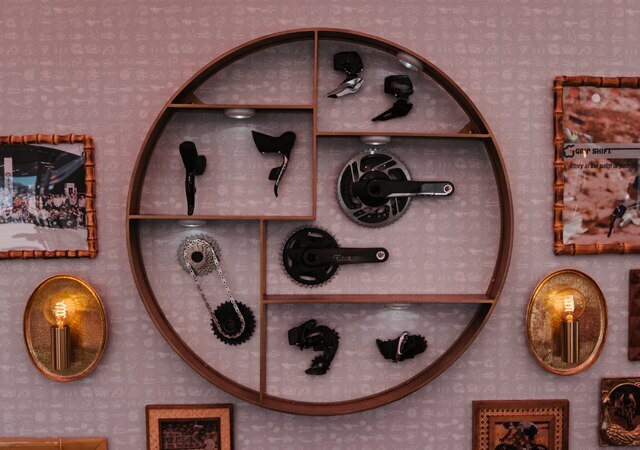 In the SRAM booth, the recently unveiled Force AXS groupset was receiving a lot of attention. Intended to compete with Shimano’s Ultegra Di2 electronic groupset, SRAM’s offering is proving to be a true contender, offering excellent ergonomics, painless App-based customization, and buttery smooth shifting. The clean wireless aesthetic and dead simple installation are really just a bonus. SRAM’s AXS technology has also made its way into the dirt with the AXS Reverb dropper post. SRAM chose to highlight its flagship mountain components, including the new Zipp 3ZERO MOTO wheelset, on this Santa Cruz Megatower. This dream bike was turning a lot of heads in the pits. 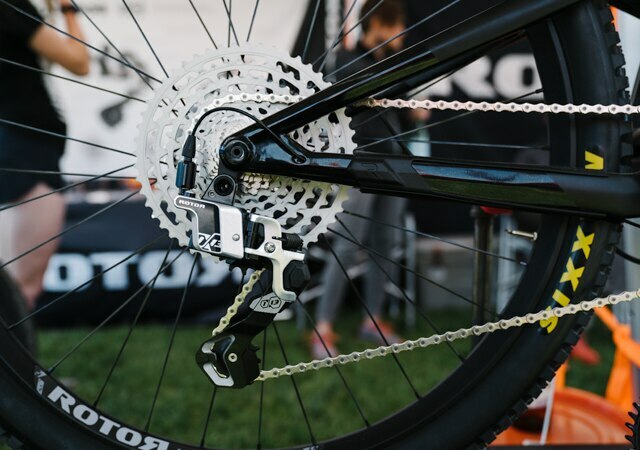 Rotor had plenty of people talking this weekend with their new hydraulic mountain drivetrain, dubbed 1×13, which compliments their similarly designed road drivetrain. The hydraulic actuation and 13 speed design are totally unique at the moment, which will make this groupset appealing to those seeking a different top tier option. OneUp Components has earned a reputation for being a step ahead of the curve, and the complete cockpit on display has a few clever details that were genuinely surprising. The biggest surprise was easily the handlebar, which has a flattened profile at the bends to induce additional flex to maximize comfort without compromising steering precision. It will be interesting to see how long it takes for this concept to be “borrowed” by competing brands. 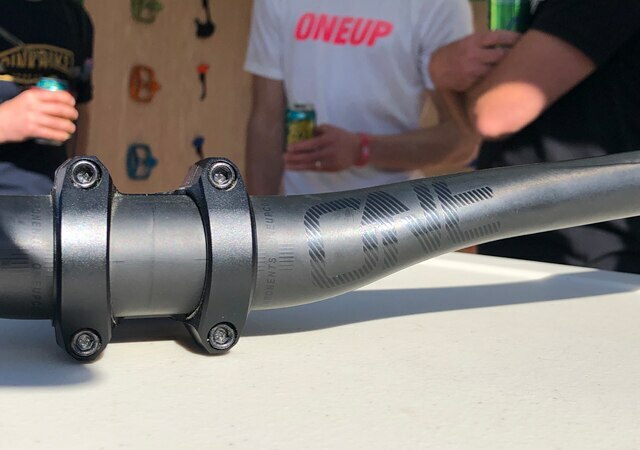 There’s also a new stem that accepts OneUp’s popular EDC tool without the need to tap the fork’s steerer tube, as the current tool requires. And the updated dropper post has gotten some reliability-enhancing tweaks as well as new construction to reduce overall length. And it’s available in four sizes, from 120mm to a massive 210mm. All sizes can be reduced in travel and length by either 10 or 20mm increments to fine tune for fit or rider preference. Consider us very impressed with the outside the box thinking on display from the British Columbia based company. 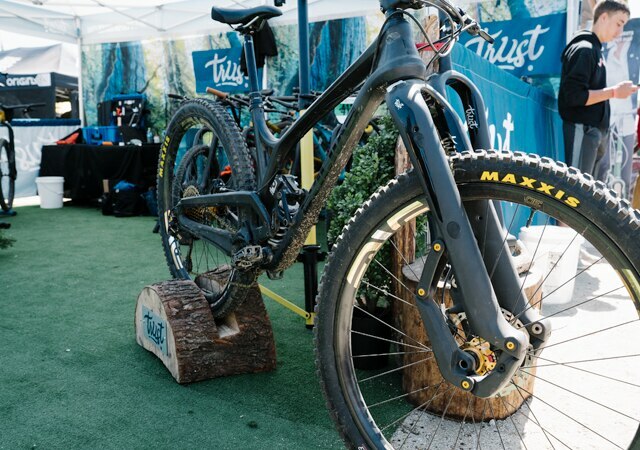 Trust’s Message fork has generated no shortage of conversation since its release, and the crew at Trust is doubling down on its efforts by expanding its demo program with the aim of allowing riders to experience the “Trust Effect” first hand. That included rolling into Sea Otter with a handful of demo bikes, which seemed to be getting a lot of attention. It wasn’t the only linkage fork at Sea Otter, but it does appear to be the most refined by a significant margin. We’re looking forward to conducting some long-term testing of our own. Ibis’s Hakka MX has established itself as one of today’s most popular gravel bikes with good reason– it’s just about perfect for its intended task. And while it’s not official, the rumor is that this Slate color will be available shortly, adding a very clean aesthetic option for this benchmark mixed terrain machine. 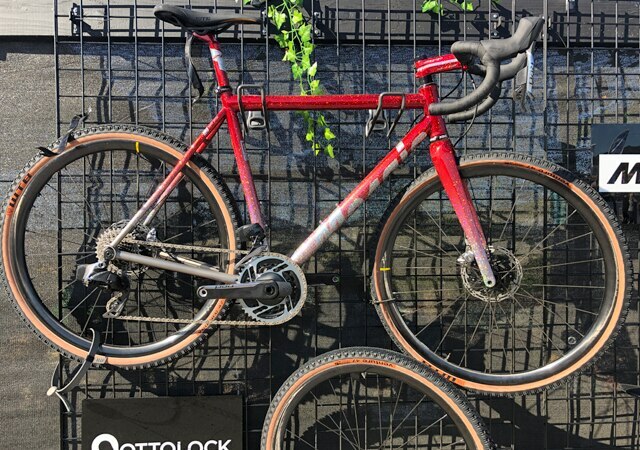 New bikes and gear may grab the lion’s share of the attention at Sea Otter, but there’s always some interesting older bikes to be seen, and in some cases, purchased. This Allsop Softride certainly fits the bill. There are always wild custom bikes at Sea Otter, but this eye popping Mosaic stood out even among the most distinctive options. We were immediately taken with the custom titanium beauty. 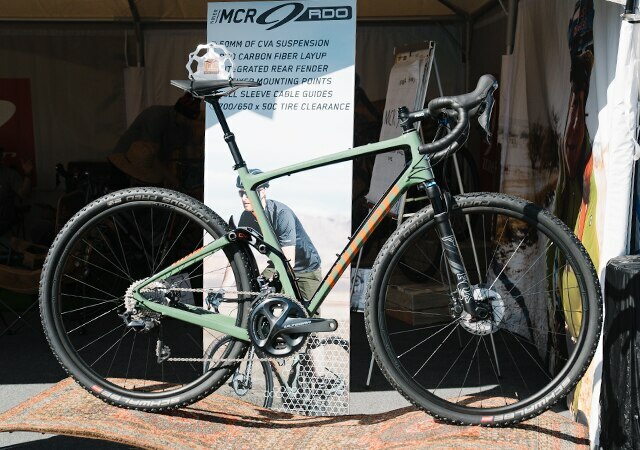 Niner’s MCR, short for Magic Carpet Ride, was originally displayed at last year’s edition of Sea Otter as a 3D printed prototype, but this year’s version is allegedly a rideable prototype. Word on the street is that there are still some refinements before it’s ready for market, primarily focused on shaving a bit more weight. That said, it’s looking production ready, and we imagine that these will be for sale before too much longer. 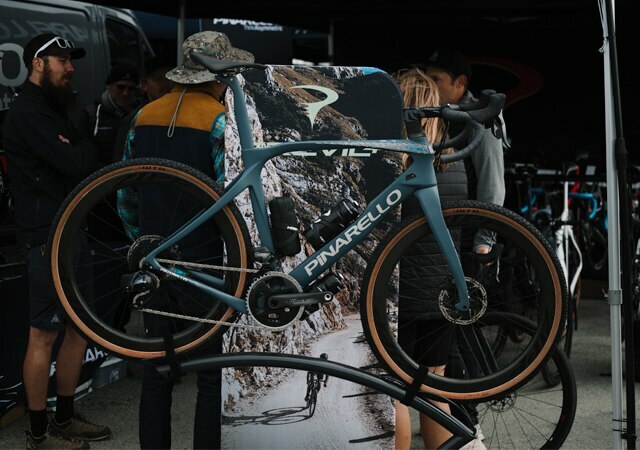 With the Grevil, Pinarello has applied its unique design philosophy to building a gravel racer that’s on par with the Dogma F10. It’s an ambitious bar to set, and the angular, aggressive Grevil most certainly looks the part. 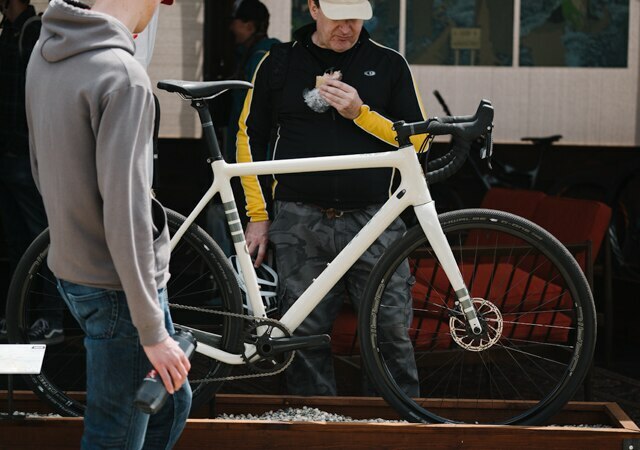 It has all the details we’ve come to expect from modern gravel bikes, including the option to run 700 x 40mm tires, or 650 x 47mm tires for those wanting even more traction. Whether it can match the reputation of the modern era’s most successful road racing steed remains to be seen, but if any brand is equipped for the challenge, it is absolutely Pinarello. Consider us very intrigued. With the 2019 edition in the books, this is merely a snapshot of the Sea Otter Classic experience. We’re heading home tired, sunburnt, and grateful to have participated once again in one of cycling’s biggest events. And if you’re in Monterey for next year’s edition, make sure to stop by and say hi. We’ll be out here.